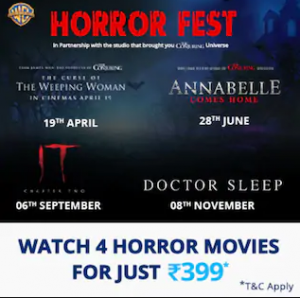 1.1 How to Get 100% Cashback on 4 Horror Movies (weeping woman, Annabelle Comes Home, IT 2 & Doctor Sleep)? 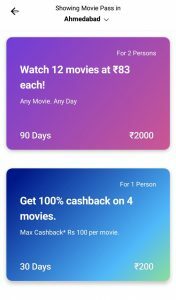 1.2 How to watch 4 Movies in Just Rs.200 from PayTM Movie Pass Offer? 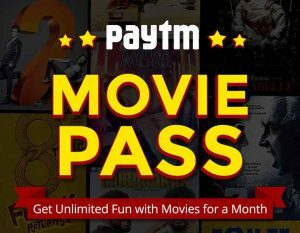 PayTM Movie Pass Offers – Hello Guys, In the Section of Movie Offers, Promo codes, are and Coupons are less. Now, You can get Benefit by PayTM Movie Voucher Offers or BookMyShow Movie Vouchers. In Short, You have to Buy Pass or Voucher and You will get Discount or Cashback Respectively. Similarly, PayTM has Launched Movie Passes. You have to Buy Movie Passes According to your Choice and You will get the benefit as Your Pass. Like Marvel PayTM Movie Pass, Which is Giving 100% Cashback. You have to Buy Voucher Worth Rs.200 and You will able to Watch 4 Movies with 100% Cashback. You can watch this 4 Movies in One Month Only and One Movie Per Day. Maximum Cashback in Rs.200 So, Book Morning Show for Maximum Benefits. See How to Buy PayTM Movie Passes? from Below. How to Get 100% Cashback on 4 Horror Movies (weeping woman, Annabelle Comes Home, IT 2 & Doctor Sleep)? 2. Now, Buy a Pass of Movie in Rs.399. 3. You will get a Unique Code. 4. Apply that Code on these 4 Movies (weeping woman, Annabelle Comes Home, IT 2 & Doctor Sleep). 5. Done, You will get 100% Cashback up to Rs.200. 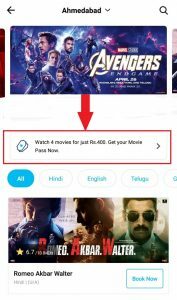 How to watch 4 Movies in Just Rs.200 from PayTM Movie Pass Offer? 2. You will see Pass Section There, Click on It. 3. Scroll Below, You will see “Get 100% Cashback on 4 Movies”. 4. Buy that Voucher in Rs.200. 5. Now, You will get 100% Cashback up to Rs.100 on 4 Movies. 6. Book Movie and Apply Code, Which You will Receive. 7. Book Morning Show, for Minimum Amount of Ticket. 8. You can Book Only One Ticket in One Day. For Booking Two Tickets, Book on 11:58 and Other Ticket After 12:00 AM. Use your unique code to get 100% Cashback up to Rs.100 on the ticket price of one movie ticket. Promo code received is valid for 30 days from the date of purchase & is only applicable for booking movie tickets on Paytm App. Movie Pass is non-transferable and is to be used by the registered Paytm account holder. The ‘Movie Pass’ holder is entitled to watch one movie a day and book tickets for up to 4 movies within 30 days of the purchase date. Convenience fees, Cancellation Protect(if availed), 3D glasses or any entertainment or government taxes will be charged additionally and are not a part of the offer under this campaign. Movie Pass transactions are not eligible for Super Cashback.